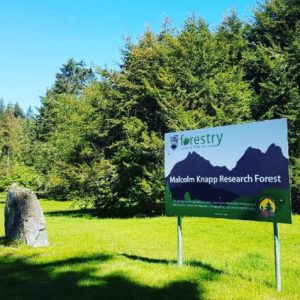 A beautiful look at the Malcolm Knapp Research Forest. Our graduate intern from 2016, Ira Sutherland, created this video sharing some of his time and work within the research forest. Students at the Mill during 2013 Spring Field School at MKRF. Peace & tranquility at Loon Lake Lodge and Retreat Centre. A youth group participating in an education program on the Timber Cruiser Circuit with Wild & Immersive. The Malcolm Knapp Research Forest team on the red trail. Spring Field School students are being given a talk at the mill by Doug Woods, owner of Gallant Enterprises. The dock is used by the Camp Goodtimes kids and other groups to launch into the refreshing waters of Loon Lake. Logging truck being loaded in a landing on road G.
Located in Maple Ridge, bordering Golden Ears Provincial Park, the UBC Malcolm Knapp Research Forest (MKRF) was established by a Crown Grant to the University of British Columbia in 1949, as a facility for research, demonstration, and education in the field of forestry and allied sciences. This 5,157 hectare “working” forest boasts more than 200km of trails and roads for walking and hiking. MKRF’s lands are being managed to conserve and protect fish, water, soil, wildlife, biodiversity, community values and traditional native uses. The focus at MKRF is the responsible use of resources to ensure sustainability. Specific sections of the forest are harvested and replanted and have been since the forest was granted to UBC in 1949. Our management of the Research Forest includes maintaining an extensive road system to allow access into more remote areas of the forest for research purposes, and maintaining comprehensive records on past and current activities occurring on the Forest. To help support this infrastructure and to create new research opportunities, harvesting is carried out on a sustainable yield basis throughout the forest. All revenue obtained through forest harvesting is reinvested in the forest to maintain and improve this world class facility. As part of our efforts to promote community forestry initiatives, our staff also manages a small (250 hectare) woodlot license located adjacent to the western side of the Research Forest. This piece of land is owned by the government of BC, and managed in accordance with the Forest Practices Code of BC. The Research Forest is also home to Loon Lake Lodge and Retreat Centre, a private year-round meeting, conference and retreat destination. Loon Lake Lodge and Retreat Centre offers facilities for overnight groups on a private lake with swimming, canoeing, and hiking access. Please visit https://loonlake.ubc.ca for more information.